Typically, the extracted CO2 from 2-5 flasks from consecutive weekly measurements were put together in one flame-off tube. The tubes were broken in the standard inlet arrangement of a dual inlet stable isotope ratio mass spectrometer, and a stable isotope measurement was performed using the same instrument used in the original analyses (Roeloffzen et al., 1991). Then, the CO2 was cryogenically trapped and converted to graphite (Aerts-Bijma et al., 1997). For the majority of the samples the amount of CO2 was sufficient for our regular, 2 mm diameter AMS targets, containing about 1.5 mg of C. For most of these, two targets could be produced from one CO2 flask. In some cases, however, the amount of CO2 was only sufficient for a smaller target. Individual standard samples were graphitized along with the corresponding atmospheric CO2 samples, so that any day to day variability in the graphitization circumstances would be visible in the standard samples. The 14C is reported as ∆14C as per Stuiver and Polach 1977. More information about 14C standards can be found at: http://www.c14dating.com/agecalc.html. More information about sample preparation and analysis at the Groningen AMS can be found at: http://www.rug.nl/ees/onderzoek/prog rammas/radiocarbonams/sampleTreatmentAms. The primary literature reference for the material presented here is Meijer et al. (2006). The statistical analysis included curve fitting described by Cleveland (1979). A seasonal pattern was then fit to the residuals, and the data are given in terms of these trends and departures from them. 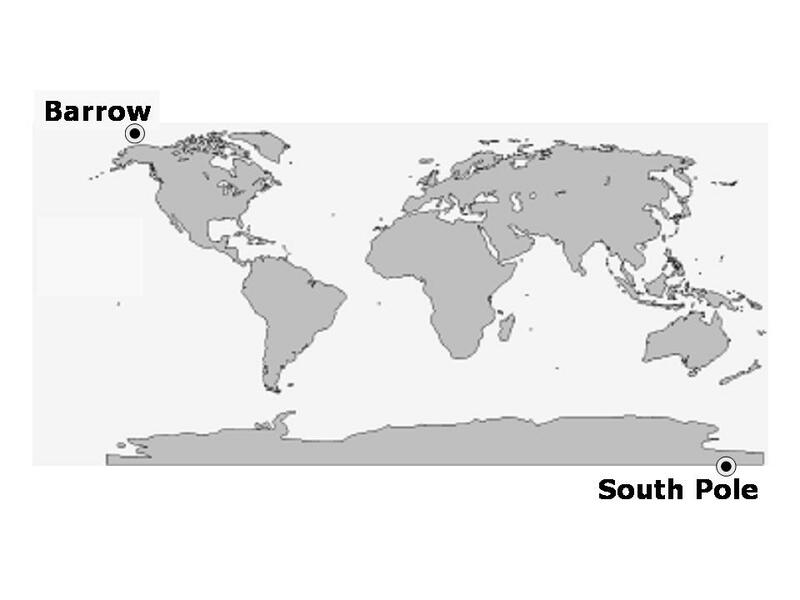 Only the trend curves are given in the “Trend Curves Only” files for the South Pole and Barrow. 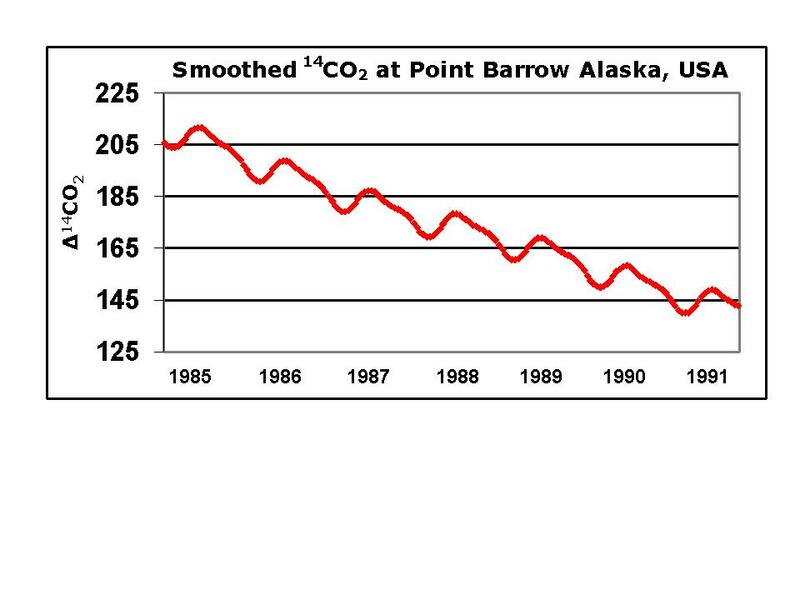 The data show a downward trend in atmospheric 14CO2 due to removal of the 14C that resulted from nuclear weapons testing during the 1940's, 50's and early 60's. The seasonal cycle, with a summer peak in both hemispheres is somewhat controversial, but is related to selective uptake of lighter isotopes during the photosynthetic season and to wind direction as the air passes over different source/sink regions on its way to the measuring site; fossil carbon emissions contain no 14C so the transport of air from fossil-carbon source regions could play a role. Aerts-Bijma, A. Th. H., H.A.J. Meijer and J. van der Plicht. 1997. AMS sample handling in Groningen. Nuclear Instruments and Methods B123:221-225. Cleveland, W.S. 1979. Robust locally weighted regression and smoothing scatterplots. Journal of the American Statistical Association 74: 829-836. Keeling, C.D., R.B. Bacastow, A.F. Carter, S.C. Piper, T.P. Whorf, M. Heimann, W.G. Mook, and H. Roeloffzen 1989. A three- dimensional model of atmospheric CO2 transport based on observed winds: 1. Analysis of observational data. In D.H. Peterson (ed. ), Aspects of Climate Variability in the Pacific and the Western Americas. Geophysical Monograph 55:165- 235. Levin, I., R. Bösinger, G. Bonani, R.J. Francey, B. Kromer, K.O. Münnich, M. Suter, N.B.A. Trivett and W. Wölfli. 1992. Radiocarbon in atmospheric carbon dioxide and methane: global distribution and trends. In: Taylor R.E., Long A., Kra R.S., editors. Radiocarbon After Four Decades. New York: Springer Verlag. p. 503-518. Levin, I. and V. Hesshaimer. 2000. Radiocarbon – a unique tracer of global carbon cycle dynamics. Radiocarbon 42(1):69-80. Levin, I. and B. Kromer. 2004. 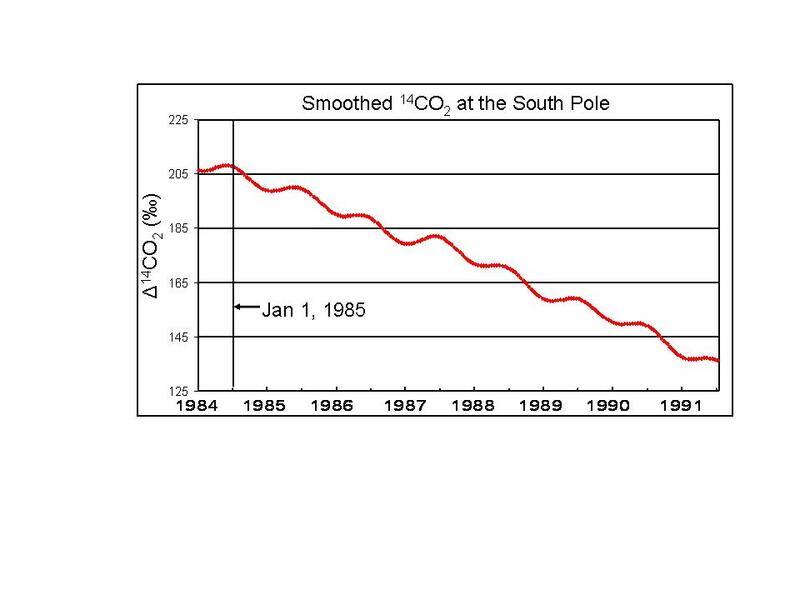 The tropospheric 14CO2 level in mid-latitudes of the Northern Hemisphere (1959- 2003). Radiocarbon 46(3):1261-1272. Manning, M., D.C. Lowe, W.H. Melhuish, R.J. Sparks, G. Wallace, C.A.M. Brenninkmeijer and R.C. McGill. 1990. The use of radiocarbon measurements in atmospheric studies. Radiocarbon 32(1):37-58. Meijer, H.A.J., J. van der Plicht, J.S. Gislefoss, and R. Nydal. 1995. Comparing long-term atmospheric 14C and 3H records near Groningen, the Netherlands, with Fruholmen, Norway and Izana, Canary Islands 14C stations. Radiocarbon 37(1):39-50. Meijer, H.A.J, M.H. Pertuisot and J. van der Plicht. 2006. High-accuracy 14C measurements for atmospheric CO2 samples by AMS. Radiocarbon 48(3):355-372. Nydal, R. and K. Lövseth. 1983. Tracing bomb 14C in the atmosphere 1962-1980. Journal of Geophysical Research 88(C6): 3621-3642. Randerson, J.T., L.G. Enting, E.A.G. Schuur, K. Caldeira and I.Y. Fung. 2002. Seasonal and latitudinal variability of troposphere ∆14CO2: post bomb contributions from fossil fuels, oceans, the stratosphere, and the terrestrial biosphere. Global Biogeochemical Cycles 16(4): doi:10.1029/2002GB001876. Roeloffzen, J.C., W.G. Mook, and C.D. Keeling. 1991. Trends and variations in stable carbon isotopes of atmospheric carbon dioxide. Stable Isotopes in Plant Nutrition, Soil Fertility and Environmental Studies IAEA, Vienna: 601-617. Stuiver, M. and H.A. Polach. 1977. Discussion of Reporting 14C Data. Radiocarbon 19(3): 355-363. Trends: A Compendium of Data on Global Change. Carbon Dioxide Information Analysis Center, Oak Ridge National Laboratory, U.S. Department of Energy, Oak Ridge, Tenn., U.S.A. http://cdiac.ess-dive.lbl.gov/trends/trends.htm Various contributors. Van der Plicht, J., S. Wijma, A.T. Aerts, M.H, Pertuisot and H.A.J. Meijer. 2000. Status report: the Groningen AMS facility. Nuclear Instruments and Methods in Physics Research B 172:58-65. CITE AS: Meijer, H.A.J, M.H. Pertuisot, and J. van der Plicht. 2006. High-accuracy 14C measurements for atmospheric CO2 samples from the South Pole and Point Barrow, Alaska, by Accelerator Mass Spectrometry [Radiocarbon 48(3)355-372]. Carbon Dioxide Information Analysis Center, Oak Ridge National Laboratory, U.S. Department of Energy, Oak Ridge, Tenn., U.S.A.